Moments later and the teams were level again, as some great work by Jonathan Bounas saw Marinos Gasparis with the easiest of strikes to restore parity. But the game was only just getting going, as Pascoe Vale once again found the lead after only 14 minutes, when Nakic was afforded to much room and neatly put the ball past Theodoridis. Gasparis was once again involved for the visitors, this time his effort was deflected into the net with some unintentional help from Pascoe Vale skipper Joseph Youseff to once again bring the sides level. With half-time approaching, Kalafatidis gave Northcote the lead for the first time, as he was first to react after Bounas’ shot was blocked in the area. The second half was a rather tame affair when compared to the first, with neither team having the level of opportunities that presented in the first. The only real chance of the second period fell to Davey Van’t Schip whose volley agonisingly sailed just over the bar. Northcote City defender Jordan Wilkes was pleased with the resilience his side had shown. “Tonight we really worked as a unit to be honest. Everybody worked hard and to be able to come back twice from going a goal down really shows the character,” Wilkes said. 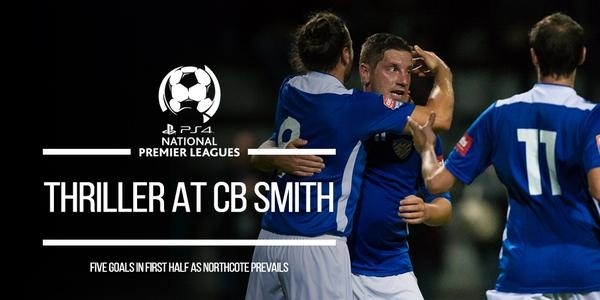 Pascoe Vale hosts Oakleigh Cannons in its next outing whilst Northcote City takes on Port Melbourne. Pascoe Vale 2 (Ferrante 3', Nakic 14') defeated by Northcote City 3 (Gasparis 8', Yousseff [OG] 20', Kalafatidis 41') at CB Smith Reserve, Fawkner.